Revd Margaret Sherwin was licensed by the Bishop of Stafford as Rector of Uttoxeter Area and is vicar of St Mary's. She arrived in Uttoxeter in July 2016 with her husband Mark who she has been married to for thirty years and their two grown up children, Luke and Leah. Margaret was born in Warrington, Cheshire (then Lancashire! ), and after their marriage they lived in Germany and then various places in this country, as Mark was a serving soldier for 13 years, before Margaret was ordained. 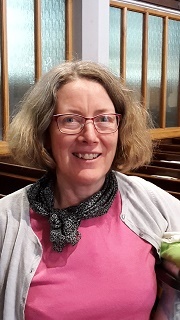 Margaret trained on the Northern Ordination Course before taking up her curacy at St Philip's Litherland, in the Bootle area of Liverpool, and then moved to Wigan in 2003. She has swapped the urban parish of Wigan for the small town and rural villages of our area. Quite a difference; but Margaret feels that God has called her here and she is enjoying the opportunity of getting to know lots of people, learning more about rural life, serving this community and spreading the Gospel of Jesus Christ. Margaret leads a team which includes 2 stipendiary team vicars, 4 Ordained local ministers, 1 retired NSM, and 2 licensed Readers. 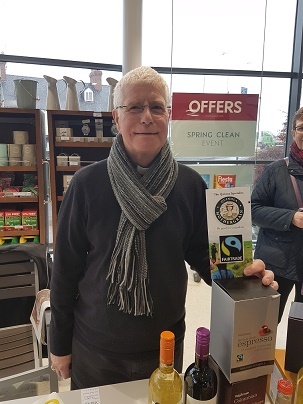 As part of the team there are also many people who because of their Christian faith volunteer to help in big ways or little ways, with things in the Church and in the community. I was born in Halifax and at an early age moved to Winson Green in Birmingham. My family moved to Uttoxeter in 1964 where I attended my last year at School. In 1965 I began my apprenticeship as an Agricultural Engineer. I retired from full time work in 2014. I am married to Diane and have two daughters and three Grandchildren. I was ordained as an Ordained Local Minister in 2003 and am licenced as an assistant curate to the diocese of Lichfield. Charles has been worshipping at St Mary's Church all his life and at some time has been part of most of the services and activities. Charles completed his training and was ordained in 2002 and now leads Sunday and Wednesday services regularly. 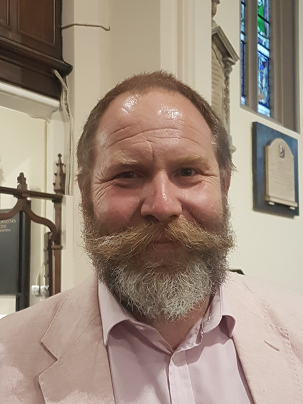 He also takes christenings, weddings and funerals and many people benefit from his pastoral support inspired by his love for God and commitment to St Mary's. 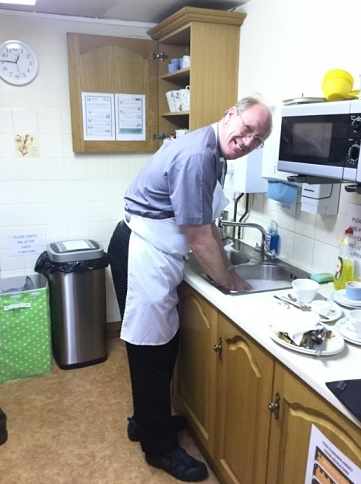 Charles worked for many years in education and is still using his skills in schools in the area and he is particularly well-known to the children at St Mary's School. Jackie is one of the Church Wardens at St. Mary’s. and is often found at the 18.00 service. Jackie lives in Marchington with her grown-up Children Philip and Vicky, where she moved to 2 years ago having lived in Uttoxeter for 20 years. She works at Tesco’s as a Fishmonger having been trained at Billingsgate Fish Market in London. Jackie has 2 dogs & 7 cats, which she enjoys exercising. Graeme is one of the Church Wardens at St Mary's. He can usually be found at the 8.00 or 9.30 services which he sometimes leads and he has just trained to help with the administration of the cup. He lives in Uttoxeter with his wife Sue and their two children Polly and Lottie who attend the 9.30 Sunday School. He works part-time at Keele University as a Senior Lecturer in Chemistry. 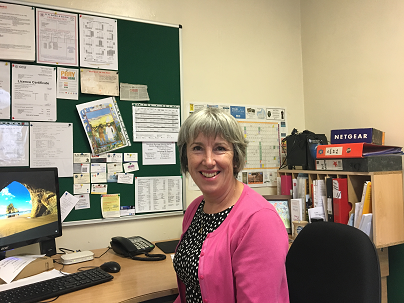 Lesley is based in the office at St Mary's Church and assists with the smooth running of the Uttoxeter Area of Parishes. Lesley's faith is very important to her and she sees this job as an opportunity to serve our loving God. Married to Andy, they moved to the area in 2013 and have a grown-up family, a flock of sheep and some idle chickens. They quickly became involved with St Mary's Church, willing to lead services, support technology and lead a home group. Lesley also became a Foundation school governor, a role she thoroughly enjoys. 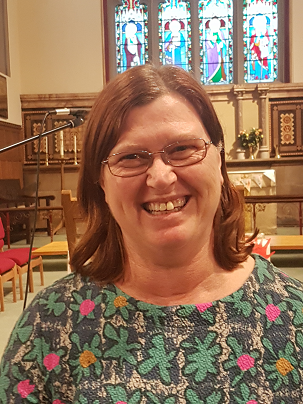 Lucy is usually to be found helping to lead the service or setting up the tech at the new 6 pm Evening Service of Prayer and Praise each Sunday at St Mary's, and also occasionally takes some of the village services. Having done the two year reader course in the diocese, she was licensed to the area in 2015. Lucy is Chair of Governors at St Mary's School and works part time in the NHS, other important things include playing tennis, zumba and going for walks with family and friends. Mo is a pioneer minister and director of Ministry at Work, an organisation which seeks to give pastoral support to busy professionals in the work place. She is a Lay Canon at Lichfield Cathedral and works closely with the diocese as well as helping to lead the 6.00p.m. service at St Mary's. Ann's grammar school produced several musical celebrities, and during her years at Pinner County, Ann shared the music room with a young pianist named Reg Dwight - now better known as Elton John. In her early twenties, Ann qualified as a State Registered Nurse at London's St. George's Hospital. 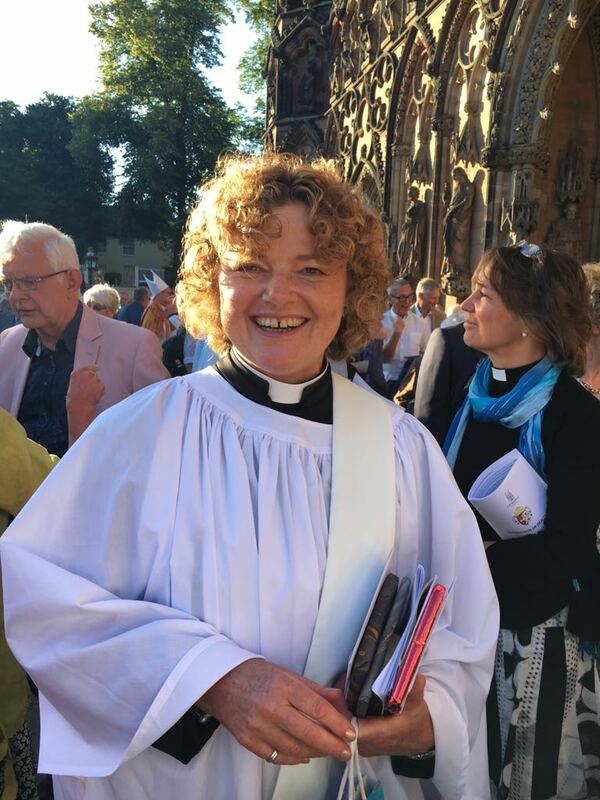 She then worked for several years in Norway before returning to England to gain a degree at Lincoln Theological College and go on to become a Church of England priest. In the early 1990s, Ann met two playwrights who were in search of a new character, and the Vicar of Dibley appeared on screen soon after ! 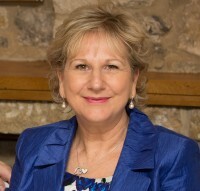 Although Ann's free time was very limited until her retirement, she has contributed to Mensa's Magazine and Christian newsletters and has organised and led a Mensa retreat and a number of pilgrimages. I have been a Reader since 2007 and since then I have worked across the Area of Parishes. My home is in Marchington and I am part of St Peter's Ministry Team. Together here we have a good working relationship, endeavouring to implement a variety of things from regular prayer cards to church socials. We each lead the services weekly and take turns in organising the locally led services once a month. I work with one of the young mums to run the monthly Messy church in church and twice a year in St Peter's school for the whole school. Both of which are becoming increasingly successful. I am also a Foundation Governor of St Peter's school and Talbot School in Kingstone which together is the Woodlands Federation. I take monthly assemblies in both schools and frequently lead their end of term services and special services like Harvest and Christmas. Part of my remit is to take out extended communion which I do regularly. Within the Area Mission Team I was asked to head up a Celebration Team after I'd led the Mission 14 celebrations across the area. Having led services across the area I have got to know many of the congregations and I invite different people to form a committee for each of the Celebration services we have held since 2014. We also planned and led a day of activities and worship for the area and this we plan to develop further. At the other churches of which the new incumbent will be key minister, I have helped to lead special services for them and regularly led Evensong at the Woodlands. I enjoy working within the Ministry team to lead our group of churches forward, developing more creative ways of Ministry and Mission. Lucinda grew up in rural North Yorkshire, where church played a regular part in her life. 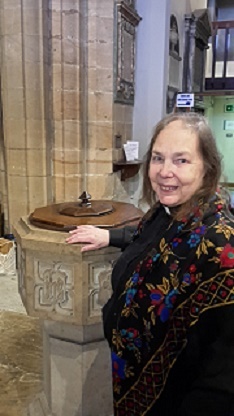 In 2005, she began to sense an insistent ‘niggling’ that God was calling her in some particular way when working as a fundraiser for Worcester Cathedral.She subsequently left the Cathedral and moved to Shropshire, but the ‘niggling’ feeling persisted and, in 2015, with the blessing of her sending church, St Chad’s in Shrewsbury, she began her ministerial training at Queen’s Theological Foundation, Birmingham. After being ordained deacon at Lichfield Cathedral in June 2018, Lucinda began her curacy in the Uttoxeter Area of Parishes during which time she hopes to be ordained a Priest, she also works full-time for the Archdeacon of Stoke-upon-Trent. Lucinda is passionate about the countryside and feels very blessed to have been called to serve her curacy here with the wealth of opportunities that the team ministry provides within Uttoxeter itself and the rural parishes, when time allows she enjoys fly-fishing and gardening (she is an enthusiastic amateur in both!) and walking her dog, Lundy, a greyhound/blue merle border collie cross.